I have a love/hate relationship with wallpaper. My husband and I spent days steaming, scraping, peeling, and painting over wallpaper borders in EVERY room of our first condo. Needless to say I got a lot of pushback when I told him I wanted to wallpaper a room in our house. Although it’s not permanent, the cost factor makes you really think about the decision. I am known for being indecisive and my likes and style has changed slightly over the years. I loved my bathroom after the renovation, but wanted to personalize it a bit more to my style. Here’s a reminder of what the walls looked like before we wallpapered. Thanks to everyone who commented on the master bathroom renovation post and helped make my decision a little easier. The Cole & Son Palm Grey was the winner! 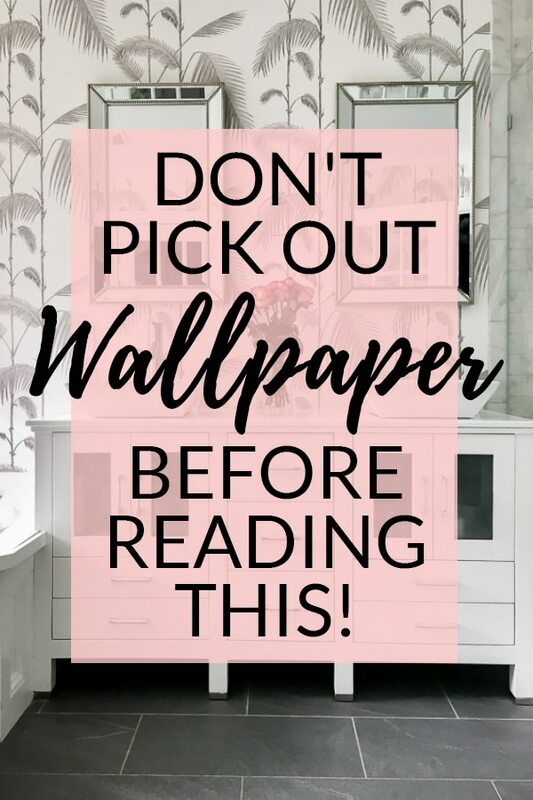 I am thrilled with the outcome and came up with some tips to help you before you tackle a wallpapering decision whether you want to add style to a living room, dining room, or bathroom like us. 1. Hire a wallpaper professional. This will ensure the wallpaper will look great and that it will last. The wallpaper hanger will likely come for a consult and take measurements of the wall/room. Wait until this is done before deciding on your perfect wallpaper, because you might reconsider after the measurements are taken. The price of one roll of paper might seem reasonable, but depending on the pattern you pick the room might require more than you expect. 2. Ask about the process! The professional who installed our wallpaper used a primer and paste all in one which makes for easy removal down the road should we decide to change or remove the wallpaper. He also paid special attention around the areas closest to the faucets and where water might splash out of the tub. I stressed this a lot in my past two renovation posts, but do not let people talk you out of something because it is not their style. You don’t have to be an interior designer to know what will make your heart happy every day! You know the look on a person’s face when you tell them what you are naming your child and they don’t approve? That’s the look I expected from most when I told them my plans. You know what you like, so don’t be afraid to take a risk! Choose a pattern that you love, but do consider the décor and color scheme in the rest of the house. Make sure it’s something you can live with. 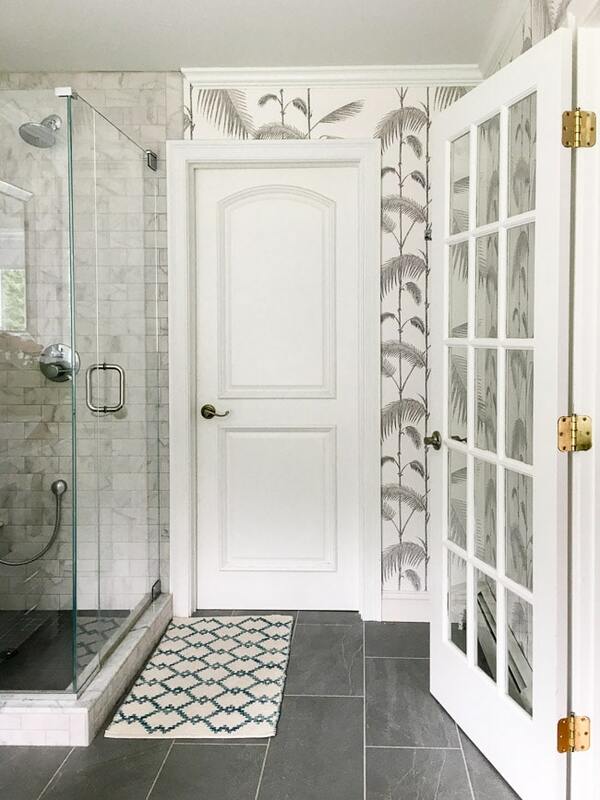 I was initially attracted to Cole and Son’s Palm Jungle paper because it is gorgeous, but ended up looking for something a little less bold in gray or aquamarine. Spend some time thinking about why you want to wallpaper. Do you want to liven up a boring room? Add drama? Add texture? 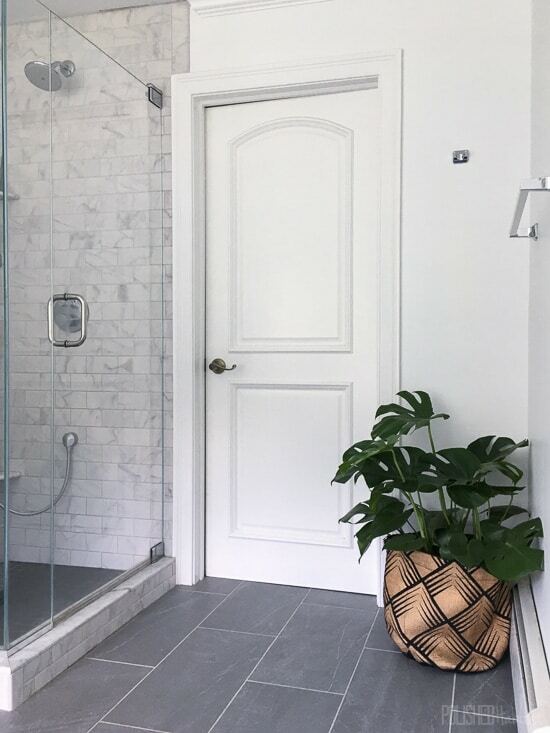 I decided on the gray and white palm print because it felt tropical and spa-like and looks great right off the navy master bedroom. When in doubt, go with a pattern that mimics nature. You can almost never go wrong there. 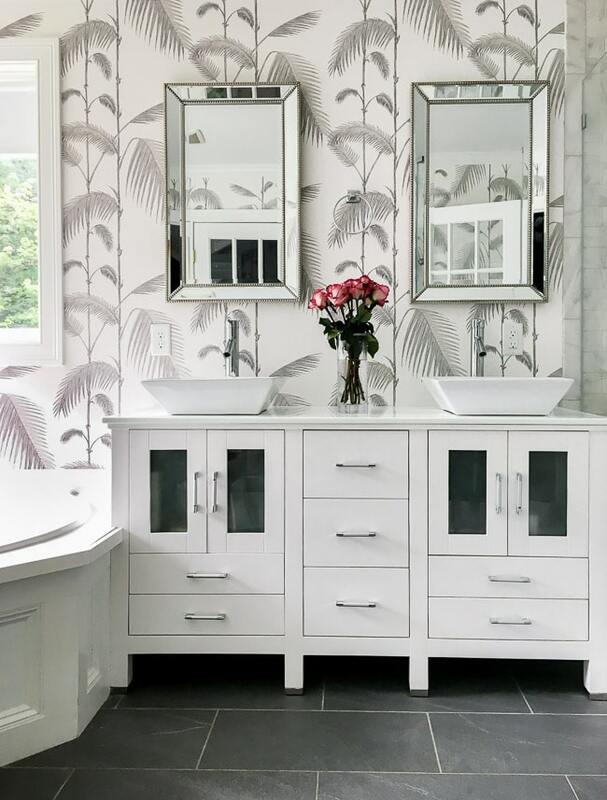 There’s a lot of pretty bold, graphic wallpaper floating around Pinterest and social media, but there are so many more wallpaper patterns out there. Don’t think wallpaper isn’t right for you. Find a good website that breaks up your wallpaper search by type –floral, contemporary, trellis, animals, etc. You will notice right away what you are drawn to. Then, order samples to see the colors in person. 6. Think of wallpaper as an alternative to wall art. Taking on blank walls around the house is daunting. Framed art, wall galleries, shelving and décor takes a lot of planning and can get expensive. With wallpaper, it’s all you need to dress up a room or accent a wall. 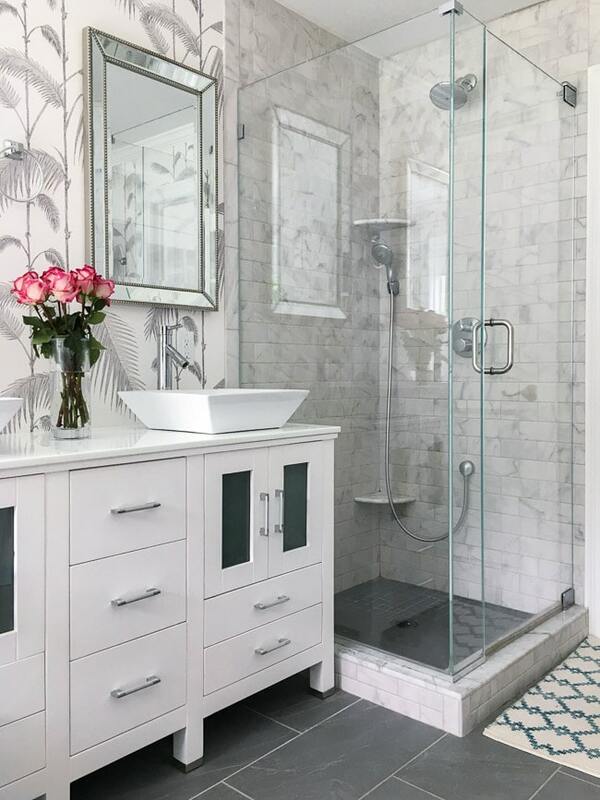 It’s also the perfect way to add personality to small spaces like powder rooms without taking up square footage. If you’ve been considering wallpaper, hopefully this post was helpful in your decision to go for it! Not ready to commit to permanent wallpaper? Check out Melissa’s list of amazing removable wallpaper options! WOW! Such a BEAUTIUL bathroom!!! Love it…great job. What a lovely start to your day to walk in there in the morning. I agree! 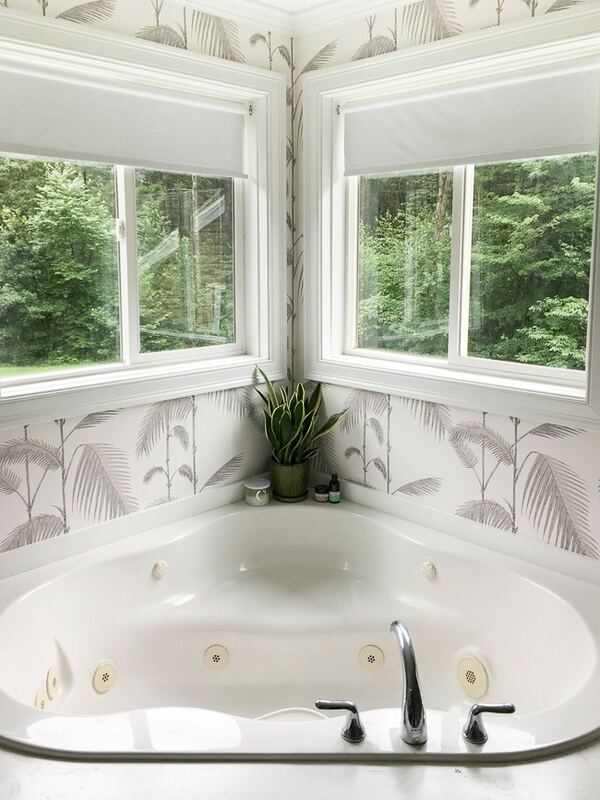 That wallpaper just pushed it over the edge from a pretty space to a totally personalized gorgeous space for Tamara to start her mornings! Love the outcome! It looks great! Great point! We’re getting ready to try some temporary paper in our hallway and if that goes well I may try the real stuff in our bathroom!